Home Blog What Is the German Education System Like? How Do the Germans View Education? Before you begin working your way to foreign language fluency, it helps to understand the culture behind the language you’re learning. After all, language exists to help a group of people express their ideas and beliefs. Germany is an old country with a rich history and culture. As you begin your German language program, gaining a strong grasp on this history, the values, and the etiquette will help you rapidly achieve success. In particular, Germans place a great deal of value on their education system, making sure that everyone in the country has access. A German blacksmith named Johannes Gutenberg invented mechanical printing. Moveable typesetting first appeared in his Mainz shop about 1439. Years later, he produced what became known as the Gutenberg Bible. For the first time, literate parishioners could read and study Scripture rather than simply having it read to them. Gutenberg’s invention made printing a revolutionary force in society. The printed word set the stage for the Renaissance, the Protestant Reformation, and a parade of documented scientific advances. Since Germany adopted the written word early on, education has an extraordinary value that is rarely overestimated. For example, about 20 percent of the Bundestag members hold terminal degrees, compared to only about three percent in the US Congress. The German thirst for knowledge motivated philosophers and writers who had a worldwide impact: Kant, Goethe, and Schiller are just three examples. It doesn’t take a visitor very long to see this reflected in the make-up of Germany’s urban culture, where one finds an emphasis on art, opera, theater, and learning. In Berlin, it’s possible to visit a different museum each day for six months. The German school system differs significantly from what is found in the United States. It reflects the German need for careful organization. All children must attend school from the ages 6 to 18, and many spend several years in a Kindergarten before entering elementary school. That elementary education, or Grundschule, continues until about the age of 10. Students then enter a period of orientation and assessment that measures aptitude and the promise of future achievement. This Orientierungsstufe stage points some students to more focused programs of study, while others might pursue a vocationally oriented period of instruction. The academic stream is known as Gymnasium, and just more than a third of German students move in that direction. It culminates in a final exam known as the Abitur. Another 20 percent of the students are sent to Realschule. Some of these young people eventually reroute to Gymnasium, while others earn a diploma that leads to acceptance at a commercial or technical college. The 16 states that make up Germany are responsible for managing public schools. This leads to a less than uniform series of educational systems. The good news for parents is that education comes without tuition fees. Private institutions are uncommon. A general high school in Germany is called Hauptschule. It is here that about 25 percent of the nation’s students take academic core classes, but with an emphasis on vocational knowledge. Graduation here leads to a Berufsschule, or vocational school. The system is designed to keep an ample supply of support staff available for the nation’s needs. But Germans also support comprehensive secondary schools, known as the Gesamtschule. Here, it’s possible to receive exposure to academic, commercial, and vocational programs on one campus. They arose out of a concern that German society was becoming too stratified, with academic and vocational students frequently separated. The vast majority of schools in Germany cling to the state curriculum, but that doesn’t mean opportunities are lacking for innovation on some campuses. Some institutions stress specific core values within the larger, mandated education. Waldorf schools, for example, emphasize creative thinking and are based on the philosophy of Rudolf Steiner. Montessori schools also thrive within Germany. German schools offer many more educational paths than most countries, but the chief distinction is an earlier turn to specialization. 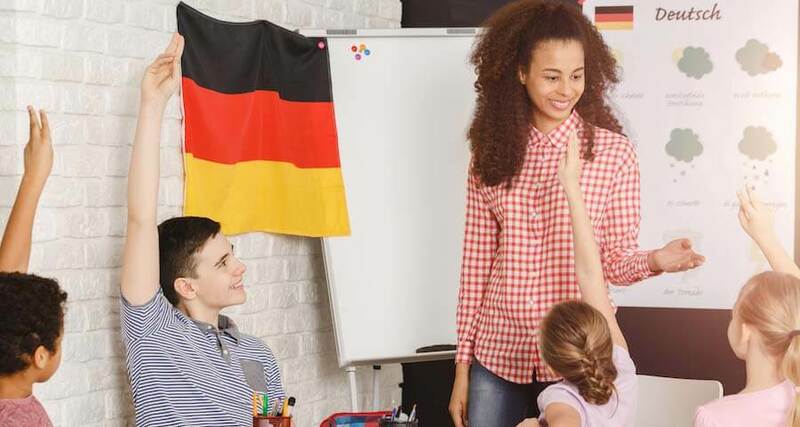 At much earlier ages, German students are groomed for specific job markets, while their counterparts in the United States and the United Kingdom work through more student-centered educational systems. With the rise of individualism in Europe, the German education model has become a much-debated subject. Students, parents, and educators are asking if a less directive system could present new benefits outside of the classroom. Children have developed new attitudes about things that correspond with changes in society in general, following changes that began to seriously take root when the Berlin Wall came down. German children are brought up to be self-reliant and independent as well as be politically aware of things. Youth are willing to ask questions and will not be satisfied with simplistic answers. The country’s strong intellectual traditions drive this thirst for learning and it is easy to see why Germany raises up successful young business leaders. University students are particularly progressive when it comes to shirking older educational conventions that do not line up with their understanding of things. The younger generations of Germans are more individualistic and moving away from their parents’ much older precepts, being more willing to embrace new ideas and new ways to do things. People in this nation value their traditional norms that have made them business leaders, yet are able to look forward at all times. One thing that visitors to Germany will discover is that this diversity in thought makes the country a very interesting place to talk to people and there is a lot to learn from them.